Camping Pouylebon is located in the Gers department , around an old Gascogne farm house. It's a family camping with private swimmingpool and a magnificent view over the sloping landscape. The camping is located in the heart of the Gascogne. The Gascogne will seduce you by its hospitality and its multivarious, charming attraction. Several villages are classifed "Most beautiful villages of France", like Fourcès, Larressingle, Lavardens, Montréal du Gers and Sarrant. The GR653 between Arles and St Jean pied, one of the famous passages to go to St Jacques de Compostella passes our campsite. You can walk this road to see the beautiful landscape. "Les tables du Gers" they always offer the most tasty recips. Let you induce by the extraordinary gastronomy, produced by the local producers. 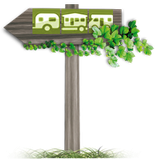 The GGG (Good Hospitable green campings) is a membership with several small campings, situated in the south of France. All owners are Dutch. All the campings are situated only several hours from each other. Don't hesitate to visit the site www.ggg-campings.com to get detailed information. In the low season we offer you, by showing us the GGG folder, a profitable rate.